Amino AcidsTrec BCAA G-Force - 360 kaps. 258 loyalty points Your cart will total 258 points that can be converted into a voucher of 10,32 PLN. TREC BCAA G-FORCE is a formula containing optimal proportions of branched chain amino acids: L-Leucine, L-Valine and L-isoleucine and a high dose of micronized L-Glutamine. These ingredients intensify the processes of anabolic (construction), allowing rapid increase in lean muscle mass. BCAA and L-Glutamine show exceptionally strong anti-catabolic effect, thereby significantly accelerate muscle recovery. BCAA G-FORCE increases strength and endurance during heavy and prolonged exercise and prevents fatigue and overtraining. Regardless of how often you exercise, your muscles need additional support and protection. Go to the topic of supplementation just as professionally as serious about each workout. Get full recovery of their muscles and provide them with the nutrients needed for growth! We are viewing improved formulation matrix, the most important amino acids exercise. BCAA G-FORCE is a unique formulation combining the advantages of a universal supplementation with branched chain amino acids (BCAA) and L-Glutamine. BCAA G-FORCE also now in convenient to use capsules KING SIZE! TREC BCAA G-FORCE is an extremely effective formula which comprehensively supports muscle growth and regeneration. The combination of the most important amino acids with anabolic and anti-catabolic in one product stimulates the process of muscle protein synthesis and inhibit their degradation during long and intense workouts. BCAA G-FORCE increases the nitrogen balance of muscle cells and the secretion of the most important anabolic hormones. Systematic use of the preparation accelerates the build quality muscle mass, and also contributes to improving all exercise parameters. BCAA G-FORCE reduces symptoms of fatigue, inhibits the breakdown of muscle proteins and prevents overtraining, regardless of the type practiced sport. TREC BCAA G-FORCE contains high doses of branched chain amino acids (BCAA) and L-glutamine, which together account for nearly 70% of lean muscle mass. Accordingly high supply of L-Leucine, L-isoleucine, L-Valine and L-Glutamine is a key factor for efficient regeneration. These 4 extremely important amino acids enable muscles to continuous adaptation to ingrown training loads. Numerous scientific studies suggest that the most effective supplementation is free amino acids BCAA and L-Glutamine. Thanks to pass them in pure form, the body does not waste time on digestion and almost immediately they reach the muscles, where it actively stimulate growth processes. 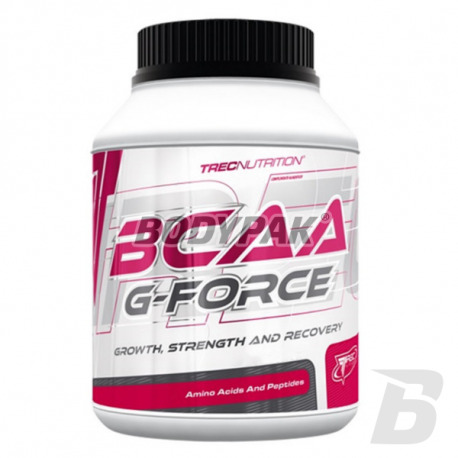 BCAA G-FORCE is a formula with a blend of only the clear, free branched chain amino acids and micronized L-Glutamine. The use of high quality materials guarantees maximum absorption and bioavailability and speed. Included in the TREC BCAA G-FORCE branched chain amino acids are an essential nutrient, supporting the maintenance of high-intensity exercise. During heavy training gradually decreasing the amount of primary energy substrates. After the exhaustion of stocks of glucose following the intensification of catabolic processes leading to the reduction of branched chain amino acids that build muscle. Additional amino acids BCAA supplementation not only protects its own muscle proteins from damage, but also adds energy. 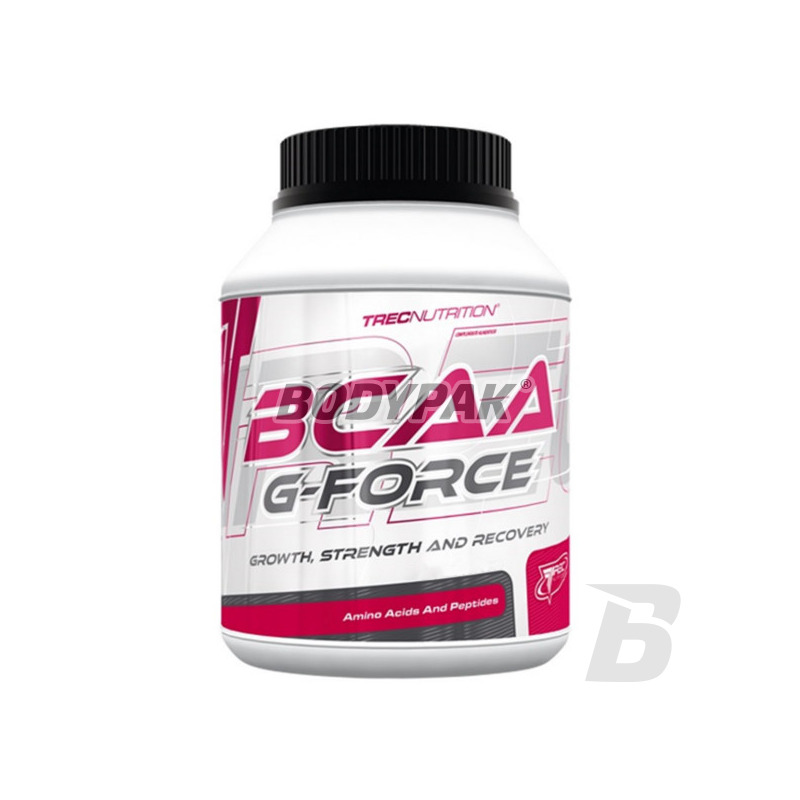 BCAA G-FORCE improves efficiency, increases muscle strength and wrestling inhibits the negative effects of catabolic processes allowing you to train longer and harder. TREC BCAA G-FORCE is a formula which significantly speeds up full regeneration after training. Included in the free form of BCAA and L-glutamine given immediately after your workout immediately start a cascade of processes leading to the reconstruction occurring during exercise microinjuries muscle. BCAA G-FORCE instantly inhibits post-workout catabolism and providing essential nutrients provides optimal conditions for anabolic processes. BCAA G-FORCE instantly stimulates muscle protein synthesis, which results in not only a quick recovery, but also a solid and stable growth of pure muscle mass. TREC BCAA G-FORCE is a universal matrix of amino acids recommended for all athletes, especially those practicing strength, speed-strength and endurance. Its supplementation supports the development of the basic characteristics of stress and increases the regenerative capacity of the body. Used before a workout prevents catabolism and increases the body's energy reserves, and after its completion stimulates growth and regeneration of muscle fibers. substancja przeciwzbrylająca: sole magnezowe kwasów tłuszczowych. Moim zdaniem najlepsze BCAA z dodatkiem glutaminy w kapsułkach na rynku! Excellent BCAA Nutrend released by the company in a unique form of ampoules containing perfectly balanced branched chain amino acids in the liquid. Quickly assimilates and inhibits catabolism!